If you love the idea of being part of a beachfront community in California, the city of Oceanside is a great place to start. The city is located between San Diego and Los Angeles and serves as a major convergence point for transportation between the two cities. Residents and visitors enjoy beautiful weather year-round that makes it easy to enjoy the beautiful surf and scenic beaches almost all year. 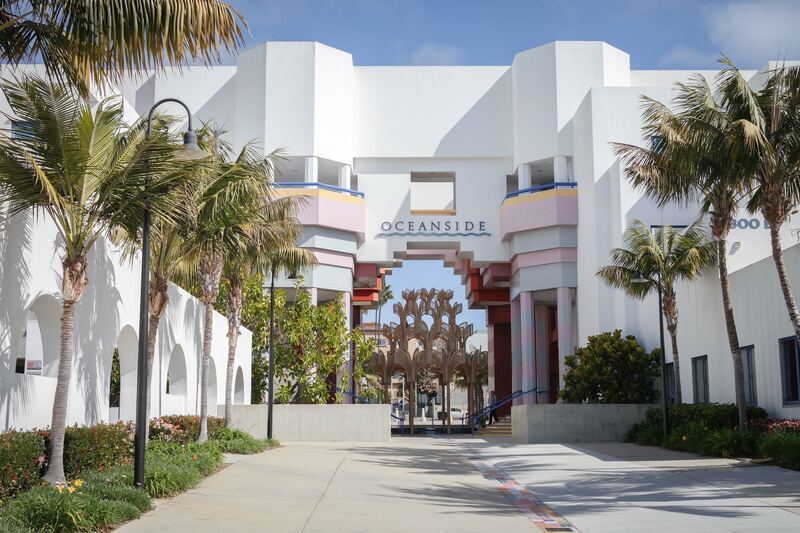 While the entirety of Oceanside is a gem, we’ll be highlighting the neighborhoods and attractions north of Oceanside Boulevard. Arrowood, Loma Alta, and Plumosa Heights are all neighborhoods north of Oceanside Boulevard that offer a little something for everyone. The communities of Arrowood sprawl across the northeast hills of Oceanside, just south of Camp Pendleton, and offer sweeping views of North County. The Arrowood neighborhood is located in northeast Oceanside, south of Camp Pendleton. The mood here is tranquil, partially due to the Arrowood Golf Course and adjacent riparian habitat. This area is growing quickly and is made up mostly of the master-planned Arrowood community. While you may be able to find some original historic housing here, you might have to drive over to Loma Alta if you want to have a selection of historic homes to pick from! Loma Alta, which is defined by the area east of 1-5, west of El Camino, north of Oceanside Boulevard, and south of Mission, is referred to by the Oceanside city visitors website as a “pioneer neighborhood” since it dates back to 1928. This area experiences less tourist congestion and has plenty of restaurants and entertainment within walking distance, making it a wonderful local getaway spot. This neighborhood and borderline city-within-a-city stretches east of 1-5, west of El Camino, north of Oceanside Boulevard and south of Mission. Across town to the northeast is an even further removed part of town, called Plumosa Heights. The historic development was constructed in 1924 and was named for the Cocos Plumosa palms that lined its cement streets. The original developer of this first-ever subdivision in the area once said it was the last remaining undivided property overlooking the ocean. Today, Plumosa Heights is a delightful neighborhood with beautiful homes and spacious backyards. While the neighborhood keeps its distance from the bustle of the heart of the city and certain amenities, it makes up for it with its breathtaking views of the ocean and well landscaped front yards. Do one or all three neighborhoods sound appealing? Then keep reading to learn more about what to expect when it comes to cost of living and entertainment in the area! When preparing to move to a new city, important costs to consider include transportation, utilities, healthcare, groceries, housing, and goods and services. In the case of Oceanside, the two factors that show the biggest difference compared to the rest of California are housing, and goods and services. Compared to the state average of California based on all 5 factors, Oceanside’s cost of living is 3% lower than the average in California. If you compare Oceanside to the national average it is 35% higher. So while you may be getting a little bit better deal living here than some places in California, there is certainly a price tag for living in such a desirable location. Real estate prices do vary between the different neighborhoods, so take a look at the following three neighborhood averages. Most homes in the Arrowood neighborhood range in price from $480,000 to $1,290,000 and sit on quarter-acre lots with four bedrooms and three bathrooms. In the Loma Alta neighborhood, home prices are more affordable, ranging from $240,000 to $1,100,000 and sit on half-acre lots with three bedrooms and two bathrooms. The median home price for Plumosa Heights neighborhood homes is around $599,000 with two to three bathrooms. All of these neighborhoods generally have driveway or garage parking. Are you prepared to move to a seaside city that has more than just beautiful beaches? Oceanside Boulevard has a ton of exciting attractions that are sure to keep you busy. At the crossroads of Oceanside Boulevard and College Boulevard are many restaurant options ranging in flavor and price. Cafe de Thai, a laid-back but sophisticated Thai eatery & sushi bar, offers a variety of sushi rolls & noodles, plus sake, wine & beer. Guahan Grill is a family-owned restaurant featuring authentic Chamorro dishes, BBQ, and a relaxed atmosphere representative of the lifestyle in Guam. Chin’s Schezuan Cuisine opened its doors in 1984 and has since opened many locations in the San Diego and surrounding areas. Here you can find the best in Szechuan and Chinese cuisine on top of great service and traditional atmosphere. While these are just a few of many tasty eateries in that area, there are also a number of great restaurants that dot the area north of Oceanside Boulevard including Irina’s Bar and Grill, Killer Pizza from Mars, and San Luis Rey Bakery and Restaurant. Of course, all these food options are fantastic, but sometimes on a hot afternoon or a night on the town, you just need a cold one to wash it all down! Whether you are a craft beer aficionado or self-proclaimed taste tester, Oceanside is the perfect spot to call home. When it comes to breweries in the area north of Oceanside Boulevard, check out the tasting rooms at Legacy Brewing Company, Belching Beaver Brewery, Oceanside Brewing Company, and Midnight Jack Brewing. If “come as you are” bars featuring drink specials and bar games are more your style, you will want to visit Maxdon’s or One More That’s It. Since there are multiple golf courses in the area including Emerald Isle Golf Course, Oceanside Golf course, and Arrowood Golf course, you may want to improve your swing by getting a few lessons at Ely Callaway Golf and Learning Center or the Titleist Performance Institute. While these restaurants, breweries, bars, and golf courses are just a few of the sights to see in the area, they will be a good place to start when you are trying to get acclimated to your new city! How about it? You’re in love with the foodie scene here, the charming neighborhoods, and the never-ending supply of breweries and golf courses, so isn’t it time to move? If the answer is yes, then great! Just pack up your life and head out! Once you roll into town though, do you have a plan for any of your belongings that may not fit into your new accommodations? If not, give us a call at A-1 Self Storage on Oceanside Boulevard in Oceanside, California. We can help you pick the best storage unit for your budget and needs. From delicate collections, family heirlooms, furniture, and seasonal decor - to boats, RVs, and luxury vehicles, we store it all! We also have everything you need for moving and storing your items safely including moving boxes, packing tape, mattress bags, and more. Our clean, secure premise and friendly staff make it easy for you to feel at ease once you load your unit up and drive away. So why wait until you get here? Get your moving plan in place and start renting with A-1 Self Storage today!